From Canterbury to Mecca, Rome to Lake Titicaca, throughout history people have traveled far and wide, often under difficult conditions, to visit sacred places. But who were these people, where and why did they go, and how did they get there? This course will explore the practice and pragmatics of pilgrimage, relying on material and literary evidence from modern and ancient case studies around the world. This course will investigate the mechanisms by which people decided to undertake pilgrimage in the ancient world. What is pilgrimage? What is a pilgrim? Why did they decide to go on pilgrimage? Did they even think of themselves as pilgrims? Where did they go, and what did they go through to get there? What implications did their journeys, and the destinations themselves, have on the world they traveled through? These and other questions will be explored with an emphasis on archaeological evidence the pragmatics of pilgrimage travel. Drawing on examples of pilgrimage and travel from around the world, we will also consider contemporary literary sources and later (medieval through the early 20th century) travelers' accounts. Not only will long-distance travel be considered, but even questions of regional and local pilgrimage and rivalry. Continuity - or lack thereof - of road and communication systems will be considered, especially within the context of how they impact modern travel and communications; infrastructure and logistics are still important issues in today’s world, and you will be encouraged to consider the implications of pilgrimage travel in the ancient world for our own. 1. Motivations: Why did people decide to undertake pilgrimage in the ancient world? What sort of economic, political, religious or other factors went into their decisions to travel? You will acquire the appropriate skills for tracing roads in the ancient world: archaeological, literary, cartographical, as well as receiving an introduction to new technologies, such as remote sensing and geographic information systems, and different theoretical anthropological foundations for movement and travel. This will involve integrating different kinds of information and learning where to go to find appropriate information. You will gain a foundational knowledge from which to critique - and improve upon - methods of investigating pilgrimage travel in the ancient world, through both literary and archaeological sources. An archaeology of ancient roads and communication systems is an exercise in filling in the gaps and learning to synthesize data that we do have, an exercise that is important and useful not only in archaeology but in any undertaking; thus, you will learn to apply this skill to real world experience. There are no required textbooks for this course. For more information on readings for the course, please go to the password-protected forum at the Joukowsky Institute wiki for ARCH 0720. Visit the Resources page for more information on pilgrimage- and travel-related initiatives around the world, as well as suggested further readings for your research papers. For weeks 3 through 7 of the semester, you will submit 1-page (400-500 words) response papers to that weeks’ readings, lectures, and discussion. Rather than writing before class, you will have the weekend following each Thursday class (thus, Sunday at midnight) to submit your responses electronically to the class blog, with the specific intention of drawing out research questions that you might want to pursue for your final paper. These can change from week to week, but the intention is to get you thinking in-depth about your final projects early on; grappling with the issues will also help you absorb and benefit from both the readings and the lectures. These ‘fits and starts’ will be graded for completion, but if it is clear that you are not thinking critically about the issues at hand, points will be removed. Participation in this course involves attendance, posing questions and making comments in class, and posting thoughtful contributions to the class blog (see course schedule for post topics). An example of a proposal will be provided so that you will have a clear idea of the elements and structure of what you are expected to provide. The goal of the proposal is to get you to the next level of thinking about your final project in terms of feasibility and structure, as well as an exercise in learning how to write a good proposal as a practical skill. Due Sunday, October 27 at midnight. You will provide an annotated bibliography of at least five sources; these do not have to have been read in their entirety, but you should explain what you foresee as the relevance to the issues you are pursuing in your final project. Examples of good and bad annotated sources will be distributed as a model. This will build upon the proposal in promoting your understanding of the scope, structure and feasibility of your project. Additionally, it will be an exercise in learning how to research for sources and grasp the usefulness of sources both before and after you may have read them. Due Sunday, November 3 at midnight. A full draft (8-10 pages) of the final paper will be submitted by week 13 (November 26). 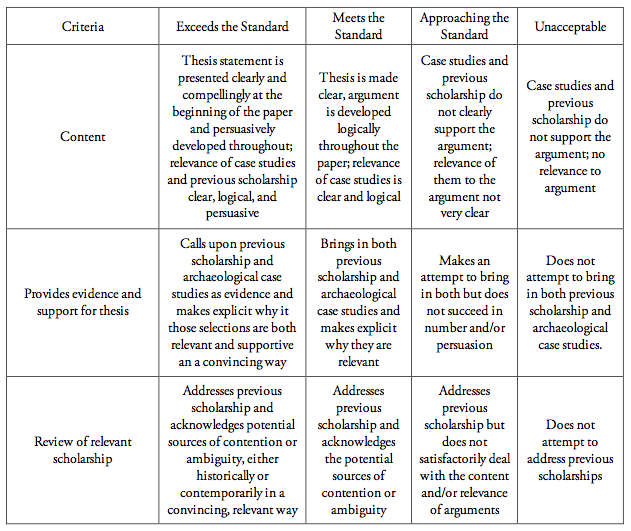 This rubric relies on the assumption that after working through the interim assignments described above that there is a clear thesis statement that will already be worked out by the time you start working on the paper. The final paper will be due on the date of the class’s scheduled exam (there will be no final exam). Assignment: What is pilgrimage? On the class blog, make a short (1-2 paragraphs) but thoughtful contribution on what you think pilgrimage is, by Sunday, September 8 at midnight. We’ll talk through these in class on Tuesday to come up with a working definition of pilgrimage that we can use throughout the term. At the end of the semester, we’ll return to this issue and reflect on how our conceptions of pilgrimage might have changed, and why. Week 2: What is Pilgrimage? tuesday, september 10: what makes a pilgrimage, a pilgrimage? Plate, S.B. 2009. “The Varieties of Contemporary Pilgrimage,” CrossCurrents 59: 260-267. Turner, V. and E.B. Turner. 1978. "Introduction: Pilgrimage as a Liminoid Phenomenon," in Image and Pilgrimage in Christian Culture. New York: Columbia University Press, 1-39.
tuesday, september 17: what do archaeologists do? Renfrew, Colin and Paul Bahn. 2008. “Chapter 3: Survey and Excavation of Sites and Features,” in Archaeology: Theories, Methods and Practice, 5th ed. London & New York: Thames & Hudson, 73-120. Gibson, Erin. 2007. “The Archaeology of Movement in a Mediterranean Landscape,” Journal of Mediterranean Archaeology 20.1: 61-87. Stopford, J. 1994. “Some approaches to the archaeology of Christian pilgrimage,” in Archaeology of Pilgrimage, ed. J. Graham-Campbell. World Archaeology 26.1: 57-72. Petersen, Andrew. 1994. “The Archaeology of the Syrian and Iraqi Hajj Routes,” World Archaeology 26.1: 47-56. Silverman, Helaine. 1994. “The Archaeological Identification of an Ancient Peruvian Pilgrimage Center,” World Archaeology 26.1: 1-18. Assignment: Fits & Starts: 1. Due Sunday, September 22 at midnight. Horden, Peregrine and Nicholas Purcell. 2000. "A Perilous Environment," in The Corrupting Sea: A Study of Mediterranean History. Malden, MA: Blackwell, 411-423. Brady, James E. 2003. “In My Hill, In My Valley: The Importance of Place in Ancient Maya Ritual,” in Mesas & Cosmologies in Mesoamerica, ed. Douglas Sharon. San Diego Museum Papers 42, 83-91. Dillon, Matt. 1997. “Introduction,” in Pilgrims and Pilgrimage in Ancient Greece. New York and London: Routledge, xiii-xix. Holum, Kenneth G. 2004. “Caesarea’s Temple Hill: The Archaeology of Sacred Space in an Ancient Mediterranean City,” Near Eastern Archaeology 67.4: 184-199. Elsner, John. 1992. “Pausanias: A Greek Pilgrim in the Roman World,” Past & Present 135: 3-29. Bauer, Brian S. and Charles Stanish. 2001. “Pilgrim’s Progress: An Archaeological and Historical Perspective,” in Ritual and Pilgrimage in the Ancient Andes: the islands of the Sun and the Moon. Austin: University of Texas Press, 213-240. Wilkinson, T. 1999. "Egeria, the Traveller," and sections 6-10 in Egeria’s Travels. Oxford: Aris & Phillips, 1-3, 124-142. Assignment: Fits & Starts: 2. Due Sunday, September 29 at midnight. Purcell, Nicholas and Peregrine Horden. 2000. Chapter 9, “Mobility of goods and people,” in The Corrupting Sea: A Study of Mediterranean History. Malden, MA: Blackwell, 383-400. Bangert, Susanne. 2010. “The Archaeology of Pilgrimage: Abu Mina and Beyond,” in Religious Diversity in Late Antiquity, ed. David Gwynn and Susanne Bangert. Leiden: Brill, 293-328. Chevallier, Raymond. 1976. Chapter 2, “The archaeology of Roman roads,” and chapter 5, “The function of Roman roads,” in Roman Roads. Berkeley and Los Angeles: University of California Press, 65-130, 202-209. Trombold, Charles D. 1991. “An introduction to the study of ancient New World road networks,” in Ancient Road Networks and Settlement Hierarchies in the New World, ed. Charles D. Trombold. New York: Cambridge University Press, 1-9. Assignment: Fits & Starts: 3. Due Sunday, October 6 at midnight. Snead, James E, Clark L. Erickson, and J. Andrew Darling. 2009. “Making Human Space: The Archaeology of Trails, Paths, and Roads,” in Landscapes of Movement: Trails, Paths, and Roads in Anthropological Perspective, ed. Snead, Erickson, and Darling. Philadelphia, PA: University of Pennsylvania Museum of Archaeology and Anthropology, 1-19. Leyerle, Blake. 2009. “Mobility and the Traces of Empire,” in A Companion to Late Antiquity, ed. Philip Rousseau. Chichester: Wiley-Blackwell, 110-123. Talbert, Richard J.A. 2012. "Introduction," in Ancient Perspectives: Maps and Their Place in Mesopotamia, Egypt, Greece, and Rome. Chicago: University of Chicago Press, 1-8. Bender, Barbara. 1999. “Subverting the Western Gaze: mapping alternative worlds,” in The Archaeology and Anthropology of Landscape: Shaping Your Landscape, ed. Robert Layton and Peter J. Ucko. New York: Routledge, 31-45. Assignment: Fits & Starts: 4. Due Sunday, October 13 at midnight. Kolb, Anne. 2005. “Transport and Communication in the Roman State: The cursus publicus,” in Travel and GEography in the Roman Empire, ed. Colin Adams and Ray Laurence. New York: Routledge, 95-105. Dietz, Maribel. 2005. Chapter 4, "Women and Religious Travel," OR Chapter 6, “Christian Travel in the Early Islamic Period,” in Wandering Monks, Virgins, and Pilgrims: Ascetic Travel in the Mediterranean World, AD 300-800. University Park, PA: Pennsylvania State University Press, 107-153, 189-212. Candy, Julie. 2009. Selections from The Archaeology of Pilgrimage on the Camino de Santiago de Compostela: A Landscape Perspective. Oxford: Archaeopress, 86-102. Al-Resseeni, I. et al. 1998. “An exploratory survey of the water supply structures on the Syrian and Egyptian pilgrim routes to Mecca and Medinah,” in Life on the Edge: Human Settlement and Marginality, 127-138. Assignment: Fits & Starts: 5. Due Sunday, October 20 at midnight. Parker, A.J. 1990. “Classical Antiquity: the Maritime Dimension,” Classical Antiquity 64.243: 335-346. Kingsley, Sean A. 2008. "Mapping Trade by Shipwrecks," in Byzantine Trade, 4th-12th Centuries, ed M. Mundell-Mango. Oxford: Ashgate, 31-36. Chevallier, Raymond. 1976. Chapter 4, “Life on the Road,” in Roman Roads. 178-201. Constable, Olivia Remie. 2003. "'Accepting All Comers': a cross-cultural institution in late antiquity," in Housing the Stranger in the Mediterranean World. Cambridge: Cambridge University Press, 11-39. Assignment: Project Proposal due on Sunday, October 27 at midnight. Given, Michael. 2004. Chapter 5, “Living Between Lines,” in The Archaeology of the Colonized. London & New York: Routledge, 69-92. Dietz, Maribel. 2004. “Itinerant Spirituality and the Late Antique Origins of Christian Pilgrimage,” in Travel, Communication and Geography in Late Antiquity: Sacred and Profane, ed. Linda Ellis and Frank L. Kidner. Burlington, VT: Ashgate, 125-134. Elsner, Jas and Ian Rutherford. “Introduction,” to Pilgrimage in Graeco-Roman & Early Christian Antiquity: Seeing the Gods, ed ibid. Oxford: Oxford University Press, 1-40. Hunt, E.D. 1999. “Were there Christian Pilgrims before Constantine?” in Pilgrimage Explored, ed. J. Stopford. York Medieval Press, 25-40. Assignment: Annotated Bibliography due on Sunday, November 3 at midnight. Maraval, Pierre. 2002. “The Earliest Phase of Christian Pilgrimage in the Near East (before the 7th century),” Dumbarton Oaks Papers 56: 63-74. Kristensen, Troels Myrup. 2012. "The Material Culture of Roman and Early Christian Pilgrimage: an Introduction," HEROM 1: 67-78. Assignment: writing about pilgrimage: in class, we will watch National Geographic’s Journey to Mecca, a documentary about Ibn Battuta’s 14th-century journey to Mecca. On the class blog, post your reactions to the film, how it reflects the textual account, and what different kinds of information we can interpret from the various kinds of evidence. 400-500 words, Sunday, November 10 at midnight. McCorriston, Joy. 2011. "Pilgrimage Practice in Arabian Antiquity," Pilgrimage and Household in the Ancient Near East. New York: Cambridge University Press, 58-84. Gosch, Stephen S. and Peter N. Stearns. 2008. "Buddhist journeys, 400-900 CE" in Premodern Travel in World History. New York: Routledge, 75-103. Huber, Toni. 2008. "Archaeological and Discursive Rebirths of Buddhist India," in The Holy Land Reborn: Pilgrimage and the Tibetan Reinvention of Buddhist India. Chicago and London: University of Chicago Press, 251-290. MacLean, K. 2003. “Making the Colonial State Work for You: The Modern Beginnings of the Ancient Kumbh Mela in Allahabad” Journal of Asian Studies 62:873-905. MacLean, K. 2009. “SEEING, BEING SEEN, AND NOT BEING SEEN. Pilgrimage, Tourism, and Layers of Looking at the Kumbh Mela.” CrossCurrents 59:319-41.
tuesday, november 26: Full draft of final paper due. Assignment: Instead of readings for the final class, go back through the definitions of pilgrimage that we suggested and formulated at the beginning of the term. 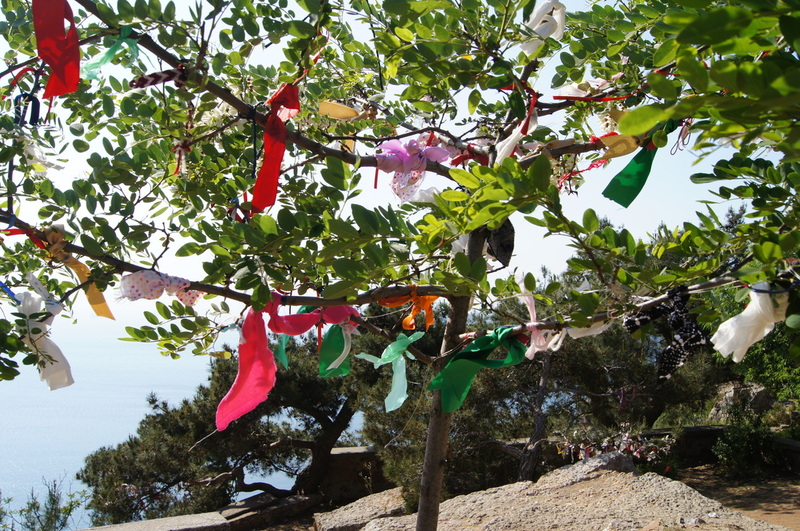 On the class blog, reflect on how your conception of pilgrimage has changed (or not), and why.